Got a lovely package from Mike at WTB today which we've been looking forward to for a while. 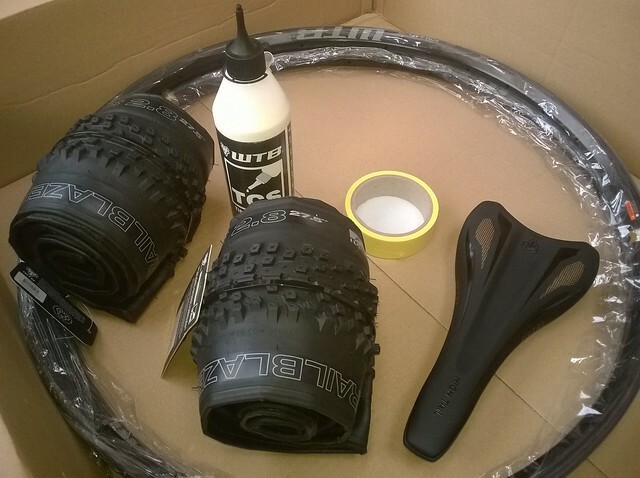 Some of their 27.5x2.8 Trailblazer "semi-fat" tyres to try out. The idea is that they give some of the float and traction of fat bikes without the weight and drag. By running them on 27.5" rim they come up a little smaller diameter than a regular 29er wheel, but a little wider with bigger volume. On the rather lovely KOM i25 rims they will fit in a Solaris so once the rims are built up we'll be fitting them to demo bikes and giving them a go. What are your thoughts on this? Drop us an email and let us know.